Can you take a Home Loan and also Claim LTCG Tax Exemption? You are here: Home / Tax Planning / Can you take a Home Loan and also Claim LTCG Tax Exemption on Sale of Real-Estate Property? Can you take a Home Loan and also Claim LTCG Tax Exemption on Sale of Real-Estate Property? Home ownership in India has always been a big dream. To realize this long-cherished dream, a home buyer may either acquire the property through a home loan (or) invest huge sums of money in the property, in most of the cases this can be his/her life-long savings. Considering the easy availability of credit, rapid economic growth and high income profiles, some property lovers go one step ahead and invest in multiple properties. Besides this the real estate investors can claim certain tax benefits on home loan re-payments and also claim tax exemption on Long Term capital Gains on Sale of property (subject to certain Terms & conditions). 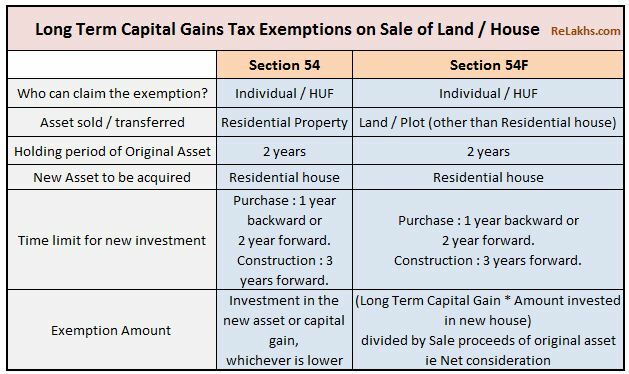 Before discussing the main topic, let us understand the few basic terms related to capital gains on sale of property and how you can save LTCG tax. When you sell a capital asset, the difference between the purchase price of the asset and the amount you sell it for is a capital gain or a capital loss. Capital gains and losses are classified as long-term or short-term. If Land or house property is held for 24 months or less (w.e.f. FY 2017-18) then that Asset is treated as Short Term Capital Asset. You as an investor will make either Short Term Capital Gain (STCG) or Short Term Capital Loss (STCL) on that investment. If Land or house property is held for more than 24 months (w.e.f FY 2017-18 / AY 2018-19) then that Asset is treated as Long Term Capital Asset. You will make either Long Term Capital Gain (LTCG) or Long Term Capital Loss (LTCL) on that investment. You may have to pay Capital Gains Tax on STCG / LTCG. Short Term Capital Gains are included in your taxable income and taxed at applicable income tax slab rates. Long Term Capital Gains are taxed at 20%. Capital gains tax on Short term gains is unavoidable and no exemptions are available to minimize your tax liability. However, you can claim exemption on Long term capital gains, which can lower your tax liability. The new house has to be bought one year before (under-construction property) the transfer of the first (old) house or within two years after the sale. For an Under construction property or flat, the construction has to be completed within three years of the transfer of the first property. If the cost of the new property is more than the capital gains, then the entire capital gains will be tax-exempt (Section 54). Let’s now consider a scenario where-in, you take a home loan to acquire this new property while investing the sale proceeds/capital gains (received by selling old property) in some other investment alternatives, can you still claim LTCG tax exemption? In this case, you are buying a property within the (above) stipulated time but not utilizing the proceeds to buy the new property. Interesting, right? Let’s discuss in detail..
Tax assessee by name Mr. Amit Shukla has sold a Property(A) in FY 2009-10 and realized Long Term capital gains of around Rs 59 Lakhs. He then acquired a new Property(B) in FY 2010-11 through a home loan of Rs 82 Lakh financed by ICICI Bank. He used around Rs 9 Lakh (out of the total LTCG of Rs 59 Lakh) to acquire Property(B) and the rest through home loan. The Tax Assessee went ahead and claimed LTCG tax exemption of Rs 59 Lakh in Income Tax Return, as he acquired the new Property(B) within the stipulated time. However, the concerned Assessing officer (AO) disagreed with this. The officer has pointed out that though the new property(B) has been purchased within the period stipulated, it has been financed through a Bank Loan of Rs.82 lakh. And, the Capital Gains utilized for purchase of property was only Rs.9 lakh. Hence the AO asked the Taxpayer to pay tax on the balance capital gains of around Rs.50 lakhs (= Rs 59 lakhs – Rs.9 lakhs). This case was referred to the Income Tax Appellate Tribunal (Kolkota). 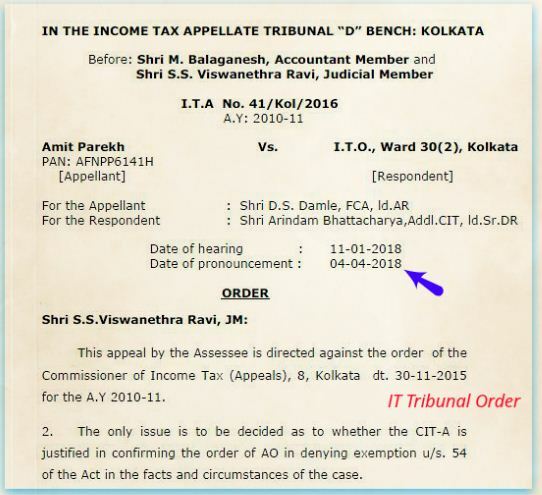 For the benefit of such taxpayers, the Kolkata Bench of the Income Tax Appellate Tribunal (ITAT) provided further clarity for availing of exemptions on LTCG while passing an order recently. Cost of the new property was more than the capital gains realized through the sale of old property. Old property was sold in the Financial Year 2009-10 and the new property purchased in the Financial Year 2010-11. Thus, the taxpayer had brought the new property well within the stipulated time frame of ‘two’ years. The tribunal has ruled that the tax deduction cannot be denied on the basis that the taxpayer has taken a home loan to make the purchase. Merely because of availing house building loan cannot be the disqualification for claim of exemption u/s. 54 when the primary conditions imposed in Sec. 54 of the Act were satisfied. So, the tax assessee is entitled to claim the entire LTCG of Rs 59 Lakh as tax exemption u/s 54 of the IT Act. This tax deduction is also available in the cases where the new property is bought 1 year before the sale of the old house or within three years (for an under-construction property) after the date of sale of the old property. The ITAT also quoted that there is no identity of funds required for claim of exemption under section 54. 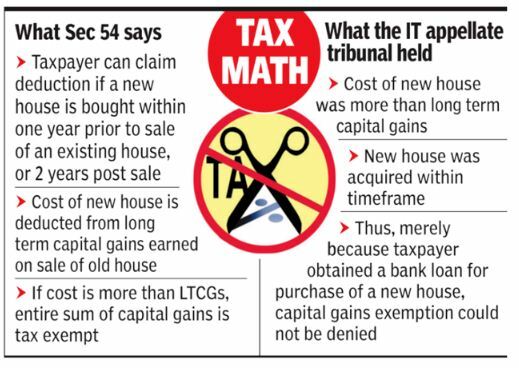 Based on these points, we can also infer that in a case where a house is bought one year before by taking loan and a tax payer sells an another house property within one year and uses the amount (assuming LTCG) to pay back the loan, such repayment should be taken as fulfilling the condition of using the sale proceeds and accordingly exemption U/S 54 or 54F is validly claimable. i had been reading your blog is very much useful for common people please keep it up. IN LTCG WE ABLE TO USE WITHOUT INDEX @10% ? Advisable to use indexation method as it will reduce your net Gains (if any). You can take FMV or the value as in 2001-02. 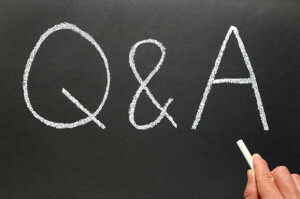 If your take the purchase cost as in 2001, your acquisition cost can be high and thus reduces your gains and tax outgo. Suggest you to kindly consult a CA in this regard. * How to save Capital Gains Tax on Sale of Land / House Property? I booked a flat in Sep 14 by paying 10% booking ammount. Took a loan in Oct 2016 to pay the balance proceeds. Possession of the flat is in Dec 2108. Now i am selling a residential plot (registered society plot) in Jul 18. Want to use the sales proceeds to pay off the loan and the bal installments incl registration costs. Q1. Will i get the benefit of Sec 54? Q2. 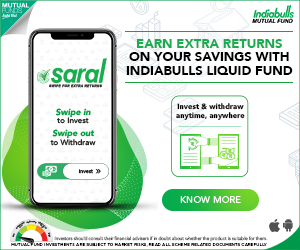 Can i commit only the LTCG component of my sale proceeds towards the sale of this asset? and in this case will the balance sale proceeds be non taxable for me? Do except my appreciation for the exemplary contents on the subject on your website. I believe that you can claim exemption. But, this can be a tricky one and can be subjective. Sreekanth Reddy, thanks a lot for the article post.Much thanks again. Fantastic.